As with any job, how much money you earn is a major concern. As a waiter, you will work long, tiring shifts, be on your feet for hours, and may deal with stressful customer service situations, so obviously you want to be paid well for how hard you work. Luckily, you will find that typically, being a waiter pays very well! Working as a waiter or waitress is a very popular job because of how much money you can make – depending on where you work you could find yourself making as much as $200 per night in tips as waiter, which can add up to a significant amount of money! Of course, the amount of money you make as a waiter is very dependent on the kind of restaurant you work in. Since most of your wages will come from the tips left by your customers, it is important to understand how the type of restaurant you work at can affect how much you will make. While some waiters can expect to leave their shift with $200-$300 for a nights work, the typical waitstaff probably earns closer to $75-$100 a night. This not only depends on where you work, but the amount of money you get paid by the restaurant itself. In the United States, waiters work primarily for tips, but the restaurant you work at still has to pay you an hourly wage. This is called being a “tipped employee” and it means that as a server you are paid an hourly wage by the restaurant you work at, but the rest of your salary comes from tips. There are government regulations in place to make sure that waiters earn an appropriate wage. The federal “tipped employee” minimum wage is $2.13 an hour, although this varies by state. This means that your boss pays you about $2-$4 an hour, and you are expected to make up the rest of your wages in tips from customers. If for any reason your tips and salary combined do not equal the minimum wage of that state, your boss is required to pay the remainder. 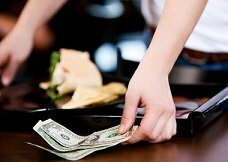 The least a server can earn would be the federal minimum wage which is $7.25 for tipped employees. 1 How Much Do Waiters and Waitresses Really Make? How Much Do Waiters and Waitresses Really Make? However, this is unusual. As a server you can expect to earn significantly more than the minimum wage. Even at a family-style restaurant, diner, or chain restaurant, you will most likely deal with happy customers who tip between 15% and 20% of their bill, meaning you are making a significant amount of money hourly! In fact, the average a waiter makes per hour is closer to $15 an hour, which is more than double the federal minimum wage! Of course, how much money you make is very dependent on the kind of restaurant you work at. There are many factors including what kind of restaurant it is (such as a 4-star reservation only restaurant versus a local chain), how much the food costs, how busy it is and how many customers there are, what night of the week it is, and what part, or “section” of the restaurant you are working in. Consider the difference: in a 4-star restaurant you may only be serving a few tables a night but they might order more than $200 in food and drinks, and may tip you upwards of $40.00. That can add up quickly, and if you get particularly generous table you could find yourself with a tip of $100 or more! However, at a local diner you may have 20 tables in the same period of time, but you might be serving college students drinking coffee, high school students eating burgers, or families grabbing dinner on their way home from a soccer game. If they only spend $10-$20, you may find you are tipped around $3-$5 a table. The work is very different, and so is the amount of money you get paid! 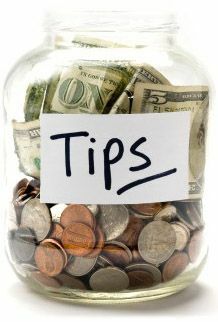 There are a few basic ways to increase your tips no matter where you work. The best way to make more money is to strive to be the best waiter you can be, whether you are serving a $200 bottle of wine or a bottomless refill of soda. If you are cheerful and efficient and do your job well, you will get higher tips! Keep in mind that customers are paying a tip in addition to their bill, and they dont even have to tip at all! Most often, a pleasant, funny, and efficient waiter will get a great tip, whereas a tired, disgruntled, or slow waiter may only get 10% which can be just a few dollars. It might be hard to work for tips at first, but most waiters know that their hard work and positive attitude will create a memorable dining experience. Ultimately you will be paid for how hard you work – if a customer sees you doing your job well they will want to pay you accordingly, so you will find it is not hard to make good money no matter where you work!